This is the first French edition of Talking God, the ninth book in Tony Hillerman's Navajo Mystery Series. This edition is a Rivages/Thriller novel published in Paris, France in 1990. The text was translated by Danièle and Pierre Bondil. 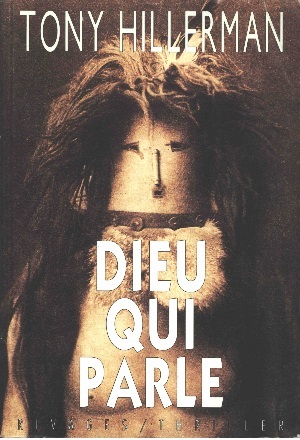 The cover illustration, though not credited, is a photograph by Edward S. Curtis of the mask of a female deity who appears with Talking God in the Navajo Night Chant. This Rivages/Thriller edition follows the typical format for the publishing house's Hillerman releases: a paperback with a tinted vintage photograph cover, a translators' guide to pronunciation of Navajo words, a map of the region covered in the novel, and an extensive glossary of historical and cultural references pertinent to the plot. Format: Paperback, 22.4 x 15.3 cm.